Very busy month! 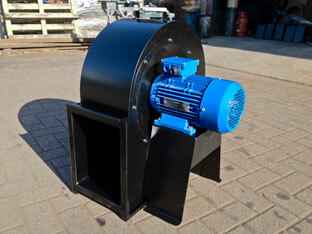 We've been designing and fabricating some modular centrifugal fans and housings, custom made to the customers requirements to shift a large amount of air. The units had to be fairly light weight to allow portability as well as the ability to be able to be attached to large ducting. 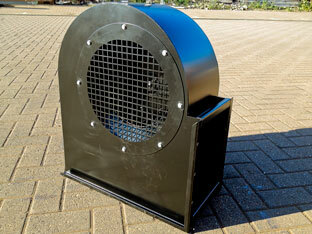 Noise would not be an issue - so we've designed the unit to just put out lots of air!. We had ten of these units to build to a very tight schedule, so the first task was the design. 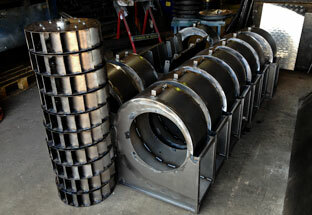 We wanted the fans to be easy to assemble and to remain straight (or true) as they were being fabricated. The solution was to use a tag system that we have used before in other designs, so that once we laser cut the components - everything just slides together via tags and slots before being Tig welded together. 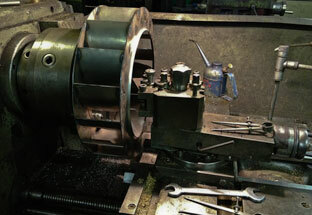 Press tools were made to produce the air inlet diameter on the inside of the fan - this is necessary to form a tube to guide and seal the moving air as it enters the inside of the rotating fan. 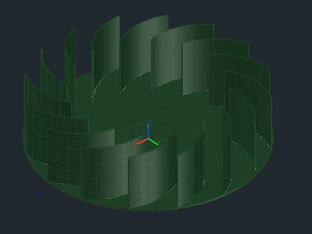 The fan blades are curved with a series of flats on the leading edge to help noise reduction and motor stress. Once the fans have been assembled, we attach the hub and bore the centre so that it is perfectly centeral to the outside of the fan profile. The fan is then roughly statically balanced before being sent for powder coating. 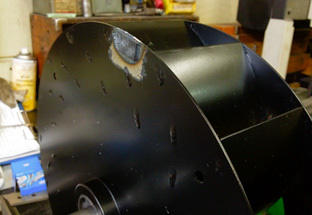 The finger guard, intake cone and motor support plates are then fitted before being prepared ready to ship to the customer. Component is featured on the website home page (June 2012).